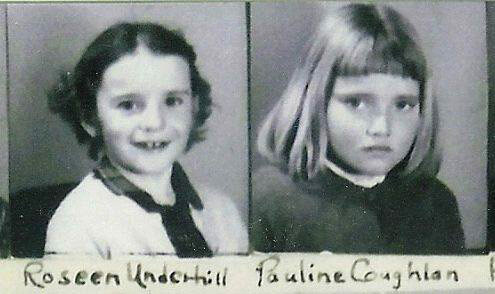 Pauline Underhill (née Coughlan) grew up in Gray Rapids, one of a dozen children. She attended the old Mountain School for six years in the late 1950’s. “Her Name Was Roseen” was written about her special childhood friend, Roseen Underhill. Read it below. It was September 1956 and my first day of school. Being a shy and timid girl I was very nervous and excited. The mile and a half walk with my four older brothers and sisters seemed to take forever. Finally we arrived at the Mountain school. 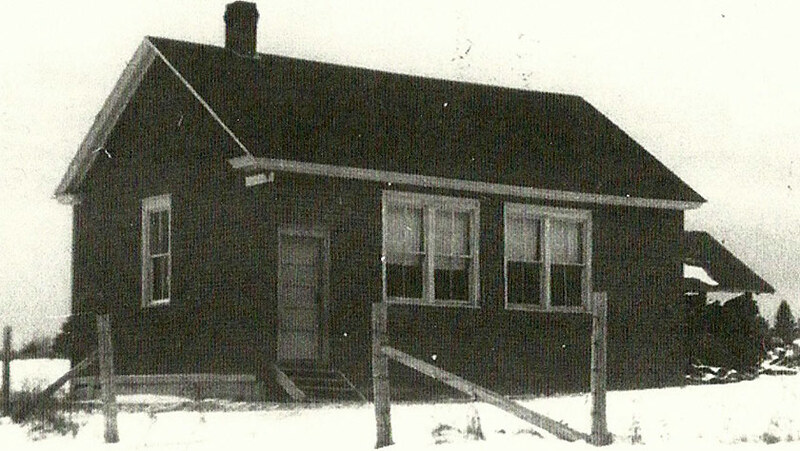 It was a typical one-room schoolhouse, just like any other that dotted our province during the 1950’s. Small with red brick shingle siding. There were windows on both sides and two doors, one at the side and one at the back. The back door opened into the woodshed where the supply of wood for the winter was kept. As you entered the side door, there was a long narrow cloakroom with a small cupboard at the end. You turned right to enter the classroom. The walls had wainscoting up so far and every available spot had a large black chalkboard, about a half dozen all together. There were about 25 desks arranged in rows according to grades. The desks were one-piece and wooden, brown with the varnish worn off. A drawer pulled out under the seat and an armrest wrapped around with the writing area in front. Tiny grooves in the top held your pencil. A large picture of the Queen hung on the wall and the pencil sharpener was located at the front. Dark green pull down blinds on the windows kept the sun out in the summer. It was a typical schoolhouse, except for one thing. Her name was Roseen. She was a tiny little girl with braids and a giggle. I can still picture her in my mind, wearing a little burgundy blazer and a grey pleated skirt. She smiled at me and I smiled back. At lunchtime all the children went outside to sit on the grass and eat our lunch. It was like a small picnic everyday. Those peanut butter and jam sandwiches out of our little tin lunch cans sure did taste good. When we sat out on the grass eating our lunch, we could hear the kids across the river at the Barnettville school laughing, shouting, and probably playing at the same things we were. When recess and lunch were over, the teacher stood on the step and rang a hand bell to call all the students in. The kids who lived close to the school went home for lunch, but we lived too far. Roseen became my friend. We were in Grade One along with four other kids. Those years at the Mountain school were happy ones. During the summer we played hopscotch, tag and baseball. Marbles was a special game back then. We dug a little hole in the sand and shot marbles with our fingers. Roseen was good at marbles. She went home every night with her pockets full. In my mind, I see a group of us, hands joined, circling a little girl sitting on the ground in the middle. Point to the very one that you love best! More times than not, it was Roseen. We spent hours playing in the sand or playing house in the woodshed attached to the school. It was surprising what we built out of the blocks of wood used to heat the school during the winter. On Labour Day all the students cleaned their desks with water and a bar of strong smelling soap. We cleaned the school from top to bottom. The older boys cleaned the yard. Every morning, after raising the flag on the flagpole in the yard, we sang O’ Canada. Everyone had a number for roll call. I remember in grade one my number was 14. I was so afraid I would forget it, I said it all the way to school the second morning. After roll call we had hand inspection. The teacher walked from desk to desk while you sat with your palms laid flat on your desk. As the teacher walked by you turned your hands over so she could see if your hands and fingernails were clean. If they weren’t, you had to go to the wash basin in the cloakroom and wash them. The teacher picked two kids everyday to walk to the neighbouring house and get a bucket of water from the spring. If Roseen and I were picked, we’d have a great time, laughing and spilling the water. One Friday every month we held a Red Cross meeting. We all wore our Red Cross pins and took up a small collection we sent to the Red Cross. We recited verses and sang songs. Oh Susanna and Billy Boy are the songs that come to mind. I remember you were lucky if you had a nickel for the collection. The morning after Halloween, we’d always find the two outdoor toilets upset as a trick. I always remember that about Halloween. Men would come and set them back up again later that day. During the winter we built some great forts back on the hill. We played one group against another. It was a game to see who could build the highest fort and make the hardest snowballs. There was no picnic for lunch in the winter. The teacher heated a big pot of soup on the stove. One by one we all got up to get a bowl of steaming soup. It was always tomato or vegetable – no broccoli with cheese for us! At Christmas we always did a program. White sheets hung from wires at the back of the school. We recited poems and acted out short plays. Two kids were assigned to pull the curtains. Parents came to see the program and all the kids received a small paper bag full of candy for a treat. Every June, we had a school closing day. We put on our new outfits and went to school for the afternoon. We played games, won prizes, got perfect attendance awards and had a picnic. It was such fun! Afterwards, us children would part ways, shouting “See ya in September!” For two months, we, the down-the-road kids never saw the up-the-road kids. But come September, the Mountain School came to life again. That’s when I would get to see my special friend, Roseen. We attended the Mountain school for six years. For grade seven we took the bus to Blackville High School. Six of us left our little one-room schoolhouse. What a scary experience that was! I was lucky because some of us had the same last name and classes were assigned in alphabetical order. But my name ended with a C while Roseen’s ended with a U. We were separated and put into different classes. We hung out together at recess until we made friends from other areas, then we drifted apart. High school passed all too quickly and we graduated in 1968. I married right out of high school. A lot of girls did that then. Roseen married shortly after. I remember one day a year or two later; my husband came home and told me Roseen had been killed in a car accident. I cried like a baby. I cried for the little girl in the burgundy blazer and braids. I cried for my friend who would never experience motherhood. I cried for that part of my past that stays with me in my memories of my childhood days forever. Her name was Roseen. Enjoy this story? Click here to read more stories written by local people. Did some research on this little girl —- Roseen Underhill married a Moody and died 1969. She was the daughter of Millet Underhill and Beatrice Kennedy. her grandparents were Arthur Millet Underhill and Mary Clementine Underhill – both descended from our Loyalist Ancestor Nathaniel Underhill 1751-1806. Arthur Millet through the Thomas Ward Underhill Sr b. 1803 Maugerville NB side of family and Mary Clementine Underhill through the British Nathaniel Underhill b. 1799 Maugerville NB side of family . Also from the lines of Coughlan ,Sutherland , Colwell , Kennedy , Vickers from 1800’s as well. I remember her too….very tiny little girl with a shy smile. I know you will have precious memories of Roseen in your heart. What a well-written and sweet story. Such a lovely tribute. Thank you for the interesting story of one room schools as it brings back memories. I enjoyed this little post. I could so relate to it as I grew up gong to the Grey Rapids school (a few miles down the same highway). My parents were Howard and Violet Curtis and there was ten in our family. It brings back a lot of memories. made an error in my last note to you —- Loyalist ancestor Nathaniel Underhill dates are 1751-1806 Sorry . Thanks David. I’ve added your research to the story. Thank you,beautiful story for a great person/cousin she was & still in our hearts. I love reading this story from time to time….thank you “Memories” for posting. Glad you enjoyed it. We’ll be posting more stories in the coming weeks. Pauline did a wonderful job on the story. Glad you enjoyed it.